Article first published as TV Review: CLOAK & DAGGER on Seat42F. Marvel’s newest drama, airing now on Freeform, is CLOAK & DAGGER. Even if you’re familiar with the comic book version (or, more accurately, versions) of the characters, there are some differences in this incarnation, as is customary with each new Marvel venture. The central dynamic is intact, though, as two individuals develop powers that associate with light and dark. When they combine them, they are more powerful. Just don’t ask how. As the television show begins, Tandy Bowen is a young girl interested in ballet. Riding with her father one night, their vehicle goes off a bridge. He perishes, but she is hit with a powerful energy wave. At the same time, young Tyrone Johnson watches his brother gunned down by police for a crime he didn’t commit. Diving into the water after his sibling’s body, Tyrone is hit with the same energy wave at the same time. Jump to years later, Tandy (now played by Olivia Holt, I Didn’t Do It) is a teenage criminal. Living in an abandoned church because she doesn’t get along with her drug-addicted mother, Tandy, with the help of her boyfriend, robs rich people. Tyrone (Aubrey Joseph, The Night Of) seems to have things a bit better, going to a private school and playing basketball. But he’s haunted by his loss and obsessed with revenge against the cop who got away with the murder. When Tandy and Tyrone bump into one another, though, their powers are activated and things begin to change. One would expect CLOAK & DAGGER’s protagonists to be adolescents, given the target audience and peer programming on Freeform, so that choice makes sense. The show is definitely geared towards that demographic, with romance being soap opera-ed as many a teen drama does, and high school junk crowding into daily activities. Superpowers and some actual issues, drugs and violence, deepen the concept a bit. But at the end of the day, the program embraces more tropes of the genre than it rejects. This isn’t as much of a detriment as the pacing, though. After a really exciting pilot, the next two hours (I screened both parts of the premiere and this week’s upcoming episode) plod along very slowly, keeping the characters apart as much as possible. Even after they interact, their connection and powers aren’t clear, and CLOAK & DAGGER is more interested in exploring backstory and personal relationships than fleshing them out. Normally, I would applaud a series who cares about the personalities more than the problems the characters face. Yet, in a show such as this, the premise needs to come along with it, and it doesn’t. Many more questions are posed than answered, but rather than presenting intriguing mysteries that will be solved, the plot seems to gloss over key elements. Presumably some of these things will have to come out as the series goes on, but viewers will be left scratching their heads about the rules of the world they’re watching and unsure as to why they’re being kept in the dark about them. Also, there’s no clear bad guy or shady organization to focus on. 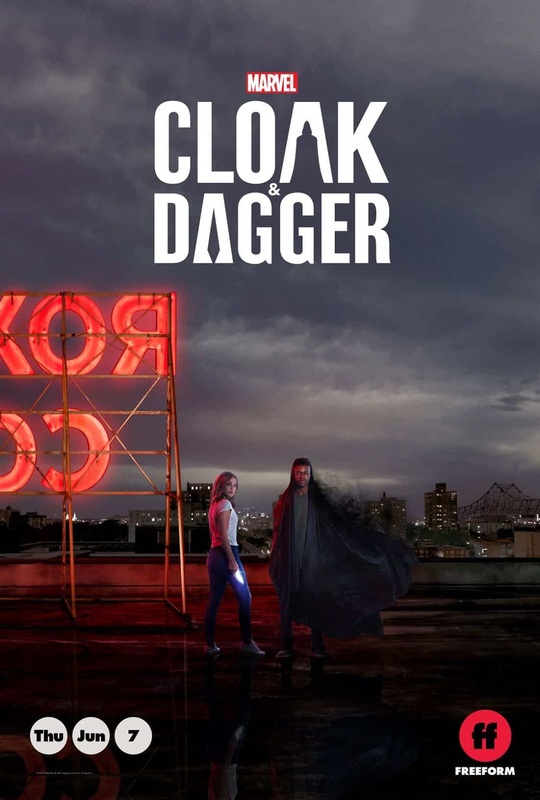 Add to that the CLOAK & DAGGER is created by Joe Pokaski, one of the man responsible for the meandering and disappointing NBC series Heroes, which suffered and never recovered from some of the same shortfalls, and it’s hard to have faith that it will be worth watching. MARVEL’S CLOAK & DAGGER airs Thursdays on Freeform.